• Lilac Hills Ranch would put 1,700 homes, retail and other buildings on 600 acres of what's now agricultural land. • Deer Springs Fire District has said it can't provide adequate emergency response to the development; the project developer pumped more than $58,000 into a recent election — more than was spent on fire board races in the rest of the county combined. • Accretive Investments also donated thousands to support Supervisor Bill Horn, whose owns property near the development. His development prospects would be dramatically improved if the project goes through. It’s easy to miss Shirey Road. 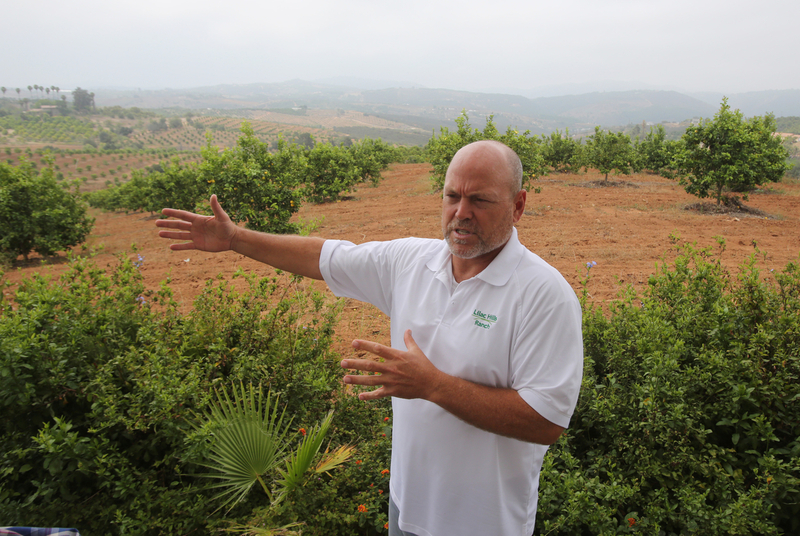 It’s a small dirt turnoff through the avocado and citrus farms nestled in the rolling hills of Valley Center, a rural town in northeastern San Diego County. The road leads to the home where Fernando Hernandez and Josie Ferrer grew up and still live with their retired parents. County officials will soon decide whether to replace the 600 acres of farm land surrounding their house with 1,700 homes, retail and other buildings in an ambitious development called Lilac Hills Ranch. The Hernandez home sits just above a bone-dry depression where the nearby hills converge. Josie and Fernando say it’s always been dry except when it rains, which is rare. For all the tree-climbing and fort-building they did as children, they never could build dams or search for tadpoles there. 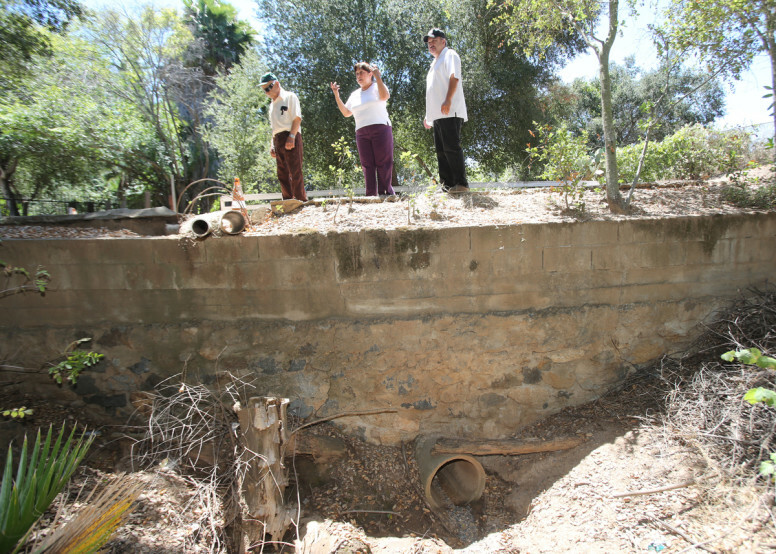 Accretive Investments, the developer of Lilac Hills Ranch, is suing the family over the dry creek. Accretive has either purchased or signed development agreements with nearly all of the Hernandezes’ neighbors. In March 2014, the company filed a lawsuit alleging the Hernandezes had a leaky septic tank that polluted the creek. That wasn’t first time the family had heard from Accretive. A year earlier, the company’s vice president, Jon Rilling, visited the Hernandezes and asked them to turn over rights to Shirey Road. Accretive would demolish the section of road the Hernandezes own and use it to build a new one that winds through the development and links it to the highway. In spring 2013, Rilling brought the Hernandez family a contract to sign. The family declined. A year later, the lawsuit arrived in the mail. “Don’t we have a right to say ‘no’?” Hernandez asked. Others have wondered the same thing – including the former director of the county’s Department of Planning and Land Use, who rejected the project, and the local fire district, which spent years saying it couldn’t provide adequate emergency response to the nearly 5,000 people who will call Lilac Hills home. Accretive had an answer for both. It appealed the planning department decision to the next wrung up the ladder, the county Planning Commission, which overturned the rejection. The company pumped thousands into a local fire district election, dwarfing typical spending for those races. It’s been allowed to move forward. County Supervisor Bill Horn, who represents the area and owns 34 acres nearby, was also buoyed by an infusion of Accretive cash in his most recent re-election campaign. The company donated $40,000 to a political action committee that supported Horn, as part of more than $100,000 the company has spent on local elections since it started pushing the project. Accretive also hired a former Horn staffer as its lobbyist. 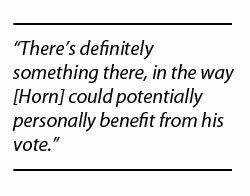 Legal experts say Horn may have a conflict of interest that could force him to recuse himself from votes concerning the project. Building the massive residential community could dramatically improve the development prospects of his property. 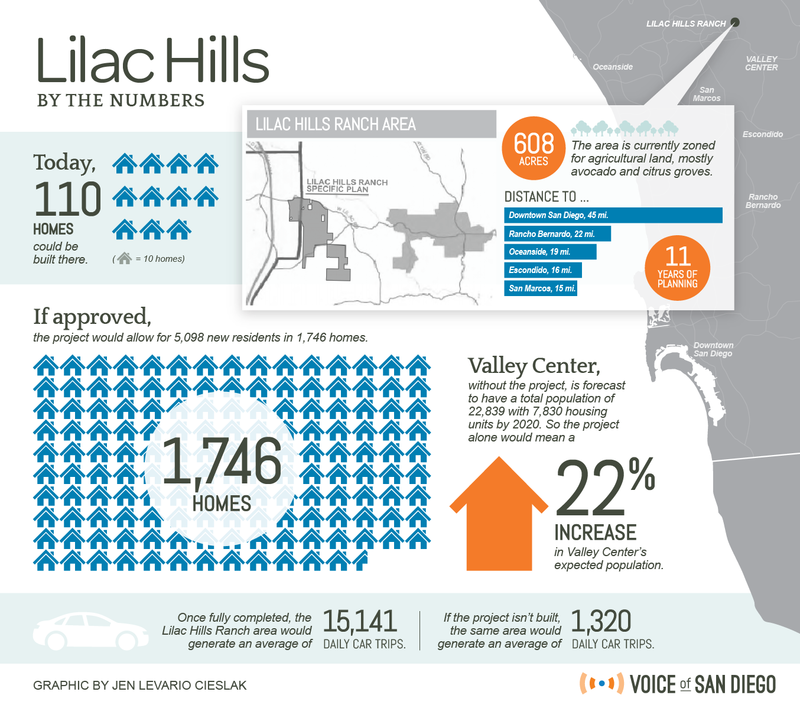 Lilac Hills is the first in a line of more than a dozen projects seeking approval from the Board of Supervisors because they don’t comply with the county’s blueprint for growth. The county spent 13 years and roughly $18.2 million rewriting that plan, which was approved in 2011. Just four years after the supervisors approved it, they could OK Lilac Hills Ranch. But as county officials get ready to start public hearings on the project, Accretive’s executives are confident. Accretive started buying up property for Lilac Hills back in 2005. Goodson said he chose the location for its gentle hills and proximity to I-15, and because it wasn’t part of identified conservation areas. He even met with the Endangered Habitats League, a local environmental group, which said he’d be fine if he stayed out of species preservation land. The group still opposed the project. Dan Silver, CEO of the Endangered Habitats League, has a different recollection. 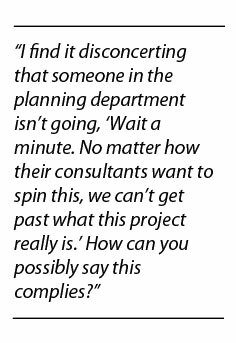 In 2009, county planners told the developers “no” as well. Approving Accretive’s project requires amending the county’s plan for future growth, called its general plan. The Department of Planning and Land Use was already writing a new long-term growth plan in 2009, and said Lilac Hills neither fit the basic guidelines of the existing plan, nor the new one in the works. Accretive appealed to the countywide Planning Commission, which overruled the decision, allowing the project to move forward. Since then, county staff has repeatedly identified areas in which the project is inconsistent with county priorities. The regional planning agency, SANDAG, formally asked the county to weigh the project against its plan, which – SANDAG reminded – aims to focus growth on the coast, away from backcountry areas. But county planners issued their final recommendation last month, and said Lilac Hills should be approved. The project hasn’t undergone any substantive changes, but staff now says the issues it highlighted a few years ago are no longer issues that should keep the project from being built. Interviews with current and former county staffers familiar with the project reinforced Gibson’s sentiment that the project isn’t aligned with county planning priorities. They declined to speak on the record because they still work in the industry. Being away from conservation areas isn’t the only reason Accretive chose to build Lilac Hills where it did. The land came cheap. Properties are only worth what can be built on them. When Accretive started buying and signing development options on the Lilac Hills property, it was cheap because it had limited development options. Then they entered into a lengthy political process to lift those restrictions. “From the developer’s point of view, the bottom line was that the land was inexpensive there,” Gibson said. Developers, county staff and representatives of a local fire district have spent years haggling over how to ensure Lilac Hills residents would be protected in case of an emergency. Their final decision was just to figure it out later. Deer Springs Fire District officials raised a red flag on Lilac Hills early. Emergency responders wouldn’t be able to reach all its residents within five minutes, a countywide requirement. The area is also highly prone to wildfires. A fire in a closed room can ignite the whole home in 10 minutes, so firefighters seek to put them out in under eight minutes, said Ken Willette from the National Fire Protection Association. In compact developments like Lilac Hills, it’s especially easy for fires to spread. That’s why standards like the five-minute rule exist. Developers and county officials looked into numerous solutions over the years – some were unacceptable to the district, others to Accretive. The county has decided it can approve the project now, and Accretive can get started building, but it’ll need to figure out a solution before it begins later phases of construction. The district needs a new station for the area, but can’t afford to pay for it on its own. Lilac Hills Ranch wouldn’t generate enough tax revenue to operate the station until the whole development is finished – 10 years down the road. Rilling said the company won’t offer any more money to the fire district. It’s already handing over $2 million in upfront fees and future residents will eventually provide another $1 million in annual tax revenue once they’re all moved in. Voice of San Diego obtained through a public records request handwritten notes by an unidentified county staffer from a spring 2014 meeting with fire district officials. The notes emphasize how the response time issue could be solved. A year later, Accretive and the district still haven’t agreed to that solution, but county planners have nonetheless paved the way for supervisors to approve the project. The solution, the staffer wrote, was for Accretive to put up more money to fund station operations. Watching the discussion turn circular, the staffer grew exasperated. But Accretive did show interest in funding Deer Springs Fire District in other ways. For the November 2014 election, the developers poured $58,800 into the three open spots on the five-person Deer Springs Fire Board, through a political action committee, Public Safety Advocates. Among the committee’s spending on local elections was $12,370 in support of Fire Board candidates Tom Francl, Robert Osby and Jean Slaughter. All three were elected. In that one fire board race, the committee spent almost the same amount as the 54 candidates in all fire board elections in San Diego County that year, according to campaign disclosures. Together, all the candidates, including those in Deer Springs, raised a combined $13,166. The two losing candidates, James Gordon and Mark Jackson, are vocal opponents of the Lilac Hills project. They didn’t receive any financial help from the PAC. A more sympathetic fire board has the authority to green-light a new station. Since joining the board, Francl – who said Accretive never told him it was supporting him in the election – has taken the lead on finding a solution. He’s pushing to build a joint station for both the local fire district and CALFIRE, a state agency. Staffing expenses would be handled by setting up a special Community Facilities District to charge residents an extra tax to pay for services, including fire protection. That idea’s been floated in the past, and it didn’t solve the impasse. “NO HORN,” reads a sign down the road from the planned Lilac Hills area. Carole Sullivan put up the sign, because she really dislikes one of her neighbors, Supervisor Bill Horn. His large home sits on the top of a large hill in the center of 34 acres he owns near the Lilac Hills site. Sullivan, who opposes the Lilac Hills project, thinks Horn shouldn’t be allowed to vote on it, given how close he lives. California’s Fair Political Practices Commission outlines when officials should abstain from votes related to property they own. It sets a series of gray lines, recognizing that every situation is slightly different. It all comes down to whether the decision would have a “reasonably foreseeable material financial effect” on the official, one that’s separate from whatever benefit the community as a whole would receive. If Horn wanted to, he could today develop his property into between four and 17 separate homes. But if Accretive transforms the area by putting nearly 5,000 residents in 1,700 new homes – and spends millions on new infrastructure for the area in the process – Horn’s property could suddenly become a much easier sell for increased development. Lilac Hills could substantially increase the value of his property, because of the infrastructure improvements that would come with it, and the way it would turn the area into a developed residential community. The state’s guidelines on these matters are intentionally vague to encourage officials to seek guidance on their specific issue, according to FPPC spokesman Jay Wierenga. “We’d obviously much rather have people ask us for advice ahead of time than have to begin an Enforcement Division investigation, which could lead to substantial fines and penalties,” he said. Horn’s office hasn’t sought guidance from the FPPC. His office didn’t respond to multiple opportunities to comment. That’s not Horn’s only relationship to Lilac Hills and Accretive. His former staffer, Chris Brown, is the company’s primary lobbyist for Lilac Hills. Brown, who left Horn’s office in 2002, lobbies in favor of many large developments in the county. Horn’s recent political campaigns, which he’s won by relatively wide margins, have pulled in big contributions from Accretive, and county developers in general. Accretive executives and their spouses each donated the maximum amount allowed to his 2008 campaign, totaling $2,500. The company has made much larger donations to political action committees supporting Horn. In Horn’s 2014 re-election bid, the company gave $37,000 combined to two political action committees, the Deputy Sherriff’s Association of San Diego County and Public Safety Advocates, which spent a total of $114,498 in support of Horn. The company also gave $10,000 to a PAC supporting County Supervisor Ron Roberts in his 2010 re-election campaign and executives gave $1,700 to Roberts directly. Accretive gave $10,000 to a PAC supporting Steve Danon, an unsuccessful challenger to Supervisor Dave Roberts. Executives also donated $700 to Supervisor Greg Cox back in 2007. Accretive said it has been donating to these PACs for years. Its contributions are “not connected with any individual race, but overall support for the type of good government that the [Deputy Sheriff’s Association] has fought for throughout the County,” said Accretive officials in an e-mail. Developers have every right to ask for changes to specific restrictions on their property. But before county or city officials can grant those changes, they must explain how the project in question is broadly consistent with the priorities spelled out in big-picture planning documents. Accretive needs a change because the land it owns is pegged for agricultural use that allows them to build just 110 homes. It needs county approval to change those restrictions so it can build their 1,700-home project. There’s one specific policy in the county’s plans making it tough to justify the changes Accretive wants. The county’s general plan outlaws so-called “leapfrog development,” or building new communities that are far away from existing homes, jobs and infrastructure. The idea is to steer growth toward already developed areas in order to preserve the undeveloped ones. There’s one exception: The county can let a leapfrog project through if it meets a special environmental certification based on its location. When the county adopted its general plan, though, Supervisor Ron Roberts made a last-minute change, allowing for an undefined “equivalent” certification for the location-based standard. It passed unanimously. Environmental and community groups welcomed the tweak, thinking they’d still gotten their way. But Gibson, the former Department of Planning and Land Use director, saw a problem right away. “I remember seeing this … language and thinking, ‘Wow, there’s a battle coming,’” he said. Lilac Hills has become the battle’s front line. The project can’t meet the original standard for having an environmentally responsible location. County staff introduced what it will use as the “equivalent” standard, one written by a subsidiary of the National Association of Homebuilders, a developer trade organization. Lilac Hills meets the new standard. At an August hearing on the project, some planning commissioners expressed doubt over the county’s decision to consider this equivalent to the county’s original standard. “You can build this in Death Valley. You can build it in the middle of the Pacific Ocean. You can build it on Mars, wherever it is, regardless of size or location, and it would be available and applicable to this standard,” said Planning Commissioner Peder Norby. If the project is approved, this standard is what opponents will seize on to challenge it in court. A lawyer for the Cleveland National Forest Foundation, an environmental group that successfully challenged SANDAG’s long-term transportation plan, already submitted a letter saying such an interpretation of the general plan would violate state law. Three other lawyers also submitted letters opposing the project, laying the foundation to challenge it if approved. The commissioners will likely decide whether to recommend the project to the Board of Supervisors at their next meeting on Sept. 11. Then the project will go to the Board of Supervisors, which has the ultimate decision on whether to approve Lilac Hills – unless there’s a lawsuit. Correction: An earlier version of this story said the county general plan was approved unanimously. It was approved on a 4-to-1 vote.